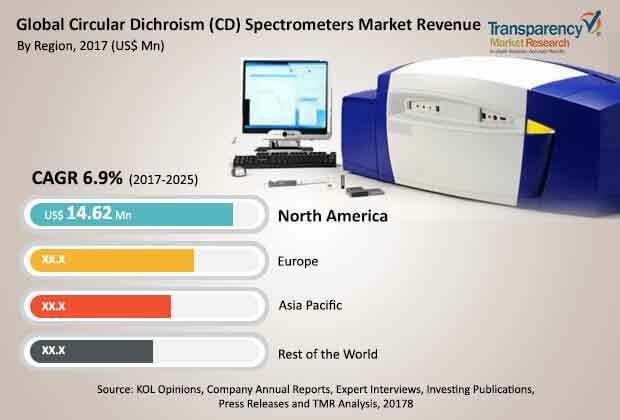 The global circular dichroism (CD) spectrometer market is anticipated to grow due to presence of several regional and international players. Some of the major companies operating in the market are Applied Photophysics Ltd., Jasco, Bio-Logic Science Instrument, Inc., Bruker, and On-Line Instrument Systems, Inc. (Olis). These companies are taking up various in-organic and organic strategies to improve the product portfolios and product offerings, along with the attempts to expand their global reach, gain more market share, and to improve their consumer base. For example, Hinds Instruments gave an authority of its microplate CD reader to another firm, Bio-Logic Science Instrument in order to be distributed to other parts of the world. The global circular dichroism spectrometers market is foreseen to expand at a CAGR of over 6.0% within the forecast period from 2017 to 2025 to reach roughly near about US$51.0 mn by the end of 2025. In 2016, the market was valued to be of worth US$ 28.0 mn. In terms of products, the segment of circularly polarized light sources, trailed by numerous light sources segment, is anticipated to lead the market and to proceed with its strength in the forthcoming years. Different light sources CD spectrometers offer simplicity to switch between the spectral wavelengths, study type, and study criteria in smaller duration. On the basis of region, in 2016, North America was accounted for maximum share of the global circular dichroism (CD) spectrometers market. This is attributed to high financing for research firms and scholastic research projects, along with advanced tools in the U.S. have contributed toward the growing share of the market in North America. Circular dichroism spectrometers are broadly used to analyze biomolecules, for example, DNA, proteins, and their related so as to comprehend their chiral nature, auxiliary structure, and the effect of different factors, for example, pH, solvent, and temperature on its asymmetric nature. As the biopharmaceutical and pharmaceutical organizations are moving their concentration from chemical details to natural medications, demand regarding the CD spectrometers is foreseen to go up. Recently launched CD modalities, for example, vibrational CD, stopped flow, FDCD, and so on are growing its application range of CD spectrometers, which is estimated to increase their reception in coming years. Researchers from different sectors are indulging into various activities to collect reference information for circular dichroism of different biomolecules which is prognosticated to draw in new scientists to receive CD spectroscopy as a favored analytical tool. DichroWeb and Protein Circular Dichroism Data Bank (PCDDB) are the two noteworthy reference information hotspots for circular dichroism. CD spectrometer is a costly capital tool which requires skilled operators and specialized infrastructure. These components encourage potential users to depend on outsourcing their R&D activities. Other than this, over-dependence on other analytical tools, for example, nuclear magnetic resonance (NMR) spectroscopy, Raman spectroscopy, and X-beam crystallography is another factor hindering the CD spectrometers market. As the biopharmaceutical and pharmaceutical organizations are moving their concentration from chemical details to natural medications, demand regarding the CD spectrometers is foreseen to go up. Recently launched CD modalities, are growing its application range of CD spectrometers, which is estimated to increase their reception in coming years.